Browse Stagg | Musical Instruments | GAK. 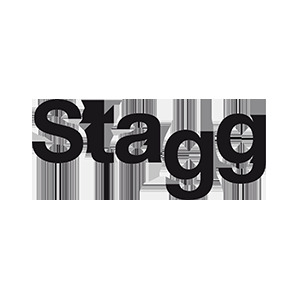 Established in 1995, Stagg are a brand dedicated to bringing high quality musical instruments and accessories to musicians of all types, at the most attractive prices. Their full range of instruments covers everything from brass and woodwind, guitars and bass, drums and pro audio, not to mention all the necessary accessories. The Dual Hammered range of cymbals are excellent on quality and price. Basic abs case for electric bass guitar - strong, light-weight, plastic abs, square-shaped, moulded case. Basic abs case for (41'') western/ dreadnought guitar - strong, light-weight, plastic abs semi-shaped moulded case. 2" Black Guitar strap w/ plastic hoop for length adjustment. Quite simply a fantastic value set of bongos - fun for anyone!. Finishes come in Black, Natural or Cherry. Finishes come in Black, Natural or Cherry. This set of excellent quality bongos are by far the best value for money on the market. The CAJ-50 Cajon is a fun instrument that anyone can play! Standard-sized birch cajon with Sunburst Brown finish. Standard-sized birch cajon with Sunburst Red finish. 15 cm plain aluminium Darbuka. 17 cm plain aluminium Darbuka. 20 cm plain aluminium Darbuka. ABS case for 2-unit rack - lightweight, stackable, moulded case made of high grade polyethylene for easy handling and durability. ABS Case with 6 Units of Rack Space. lightweight, stackable, moulded case made of high grade polyethylene for easy handling and durability . ABS Case with 8 Units of Rack Space. lightweight, stackable, moulded case made of high grade polyethylene for easy handling and durability.